Flowering apricots are deciduous trees with very early colorful flowers. In the mild winter areas these varieties often bloom in late January with bright reds, pinks, or white flowers. The flowers progress up the new limbs with color for several weeks. What make them different are the bold colors as a tree that can be seen for a long distance when no other tree is in bloom and deciduous trees are still dormant. Flowering apricots require very little chill. The L. E. Cooke Co has pioneered in these apricots which originally came from China and Japan. Mr. Clarke from San Jose introduced many of the selections and we located others in collectors’ yards. Today we produce four selections and have more in our orchard. Prune the tree when in flower for use in home arrangements. Flowering limbs can grow up to 8’ long if pruned annually to 6” to grow out all new. See examples in the photos of the varieties when you click on one of the names. The L. E. Cooke Co started production in 1963. The original was introduced in the San Francisco Bay area. 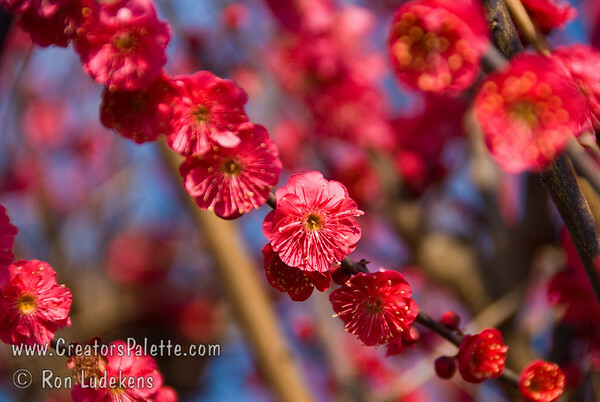 My favorite is MATUSBARA RED which produces a mass of double red blooms in late January and early February. The tree is smaller and very compact grower. The flower has fragrance and the new growth is red turning to green. I like that it is fruitless, so no mess. Height and spread to 10-12’ and hardy to Zone 7. DAWN: A beautiful display of fragrant double ruffled pink flowers. Very fragrant with a spicy scent. Appears to be fruitless. Height 15-20’ and hardy to Zone 6. PEGGY CLARKE: Double deep rose flower with red calyx and blooms early. Sets small fruit. An upright grower to 20’ and 15-20’ wide. Cold hardy to Zone 6. ROSEMARY CLARKE: Beautiful display of white double blossoms with red calyx which are abundant and very showy. They are very fragrant and set small fruit. Grows to a height of 20-25’ and 15-20’ spread. Hardy to Zone 6.